Hi there! I'm excited to share with you a tag that I created with some of the fun new products from the August Neat and Tangled release! I used the new Thanks So Much stamp set, Floral Frame Stamp set, Floral Frame Dies, Build a Tag Dies and the Gift Card Box Addition Dies. I cut the tag base out of some patterned paper that I had on hand. 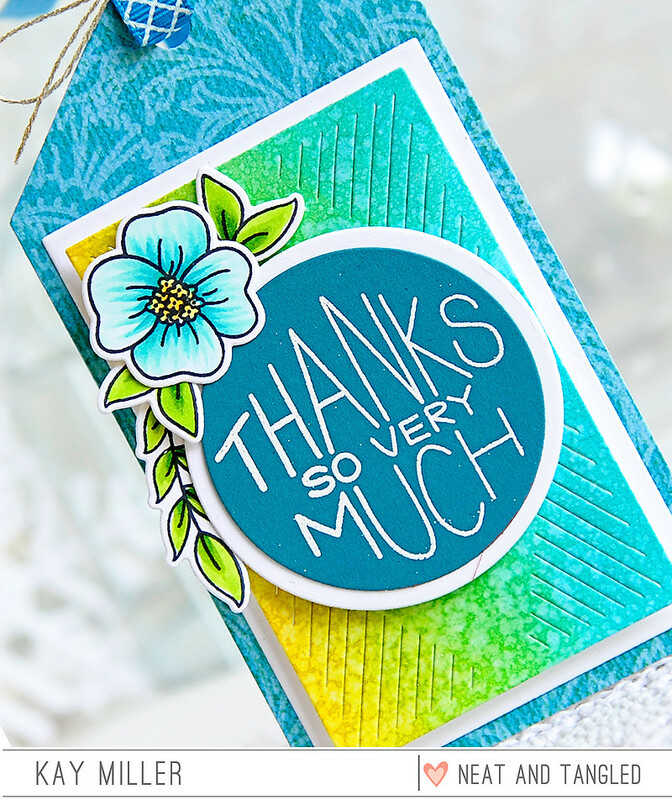 I then blended some distress inks onto card stock and cut the piece from the Gift Card Box Addition dies. I added the white background layer to the back and adhered this to my tag front. 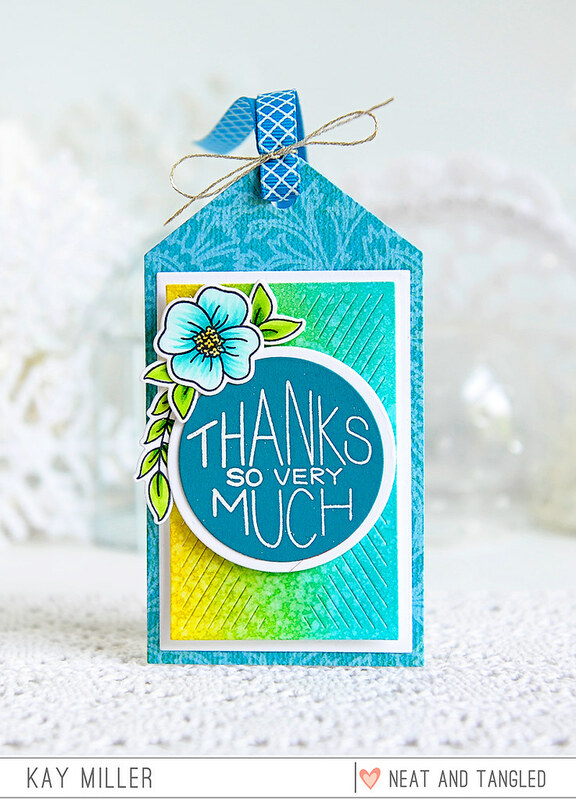 I heat embossed the Thanks so very much sentiment on blue card stock with white embossing powder, and cut it out with the circle die included in the Build A Tag die set. I cut the white circle out to mat it with, and adhered this to my tag with foam tape. The flowers and leaves are from the Floral Frame stamp set. I colored the images with Copic markers, cut them out with the coordinating dies, and adhered them to the tag with foam tape. To finish it off, I added some ribbon through the hole at the top and tied some sliver thread around it. I hope you have enjoyed my card today! Thanks so much for stopping by! This is beautiful, Kay! I love the colors and those pretty flowers! Such wonderful tropical colors. Nicely done. This is a lovely tag Kay! I like the tropical colors! What a pretty tag, Kay. The colors you chose are so lovely. I really like your blends. The flower cluster in the corner looks terrific, too. Wonderful little project!